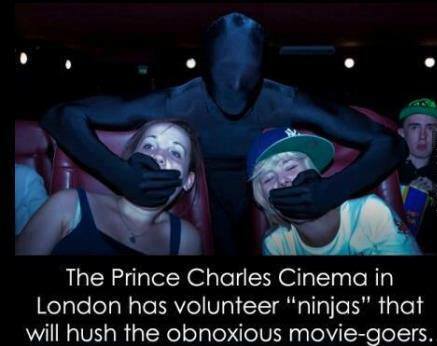 I saw this on my Facebook feed and I just thought that this was the most innovative idea for cinema in years. I’m totally for this and I’m even very much thinking about allowing these ninja to use a taser on offenders. I did not pay an exorbitant amount of money to listen to other people talk about the useless drivel of their lives. If they wanted to talk, they could have gone to a cafe or a bar or the privacy of their own home. I love film. I love watching movies and there is just no way that their incessant babbling was deemed part of the experience. Second to spoilers, a movie rule is to not speak or make unnecessary noises and sounds during a movie, really… That includes the cell phone. Shut it off.